Happy 20th Anniversary to “Girly Edition”! Original airdate 19 April 1998. Zombie Simpsons long ago stopped astonishing me with how bad it can be, but every once and a while I can’t help but marvel at just how far the writing has devolved. These episodes mostly adhere to the loosest of structures: an A-plot, a supplemental B-plot, both wrapping up near the end. But the incredibly low bar they have for what counts as a story (or as a resolution) is remarkable when you take a second to think about it. Consider this episode’s B-plot: Lisa is apparently the chief reporter for a school radio station. How do we know that? Well, we see her – all by herself but with a hat and a microphone – standing outside of a fake awards show. 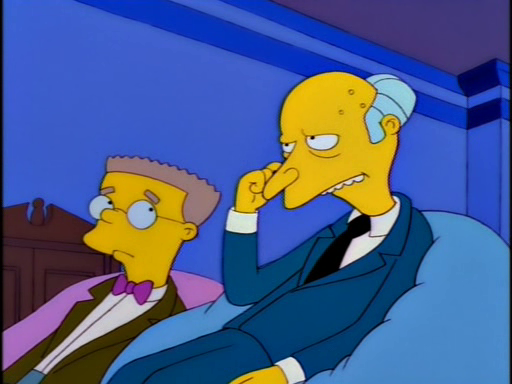 From there we see a staff meeting, one report from detention, and then Skinner abruptly ends the radio news show, causing Lisa to be apparently heartbroken. That’s it. It’s four scenes, and I doubt it’s even three full minutes of screen time, even if you count generously. It gets – ahem – resolved at the end when Homer is leading the police on a chase and Lisa gets a megaphone from Chief Wiggum so she can explain what her dad is doing. I’m pretty good at scrounging these episodes for even the most tendentious and transparent of links between scenes, but I got nothing here. The only line Lisa has after this is to tell Homer, “I’m sorry, Dad. It’s over” before he rides the caboose down a hill and off a bridge. The A-plot is just as incoherent. Patty and Selma have to move in with the Simpsons, though since they never come back after the scene where we see them move in it hardly seems to matter. Homer eats at a chili dog place from his childhood, but the owner doesn’t remember him until he does. Credits. Yeesh. – I don’t think I’ve mentioned this in a long time, but there really is no better shorthand for the difference between The Simpsons and Zombie Simpsons than the change in what happens to Homer between the original opening and the HD one they implemented back in Season 20. Homer used to see Marge’s car coming, yell, and get out of the way. Now he just gets plowed into, leaving a Homer shaped hole in the garage wall. – Huh, a 2001 opening. Never seen that before. But this one’s in the service of a giant domino setup that goes on for a full minute. That screen time ain’t gonna fill itself. – In some of the promotional hooha over the Gatsby double episode, I saw one of the staff congratulating themselves on not having Homer rap, saying it wouldn’t be funny. Well, in this episode Homer raps. 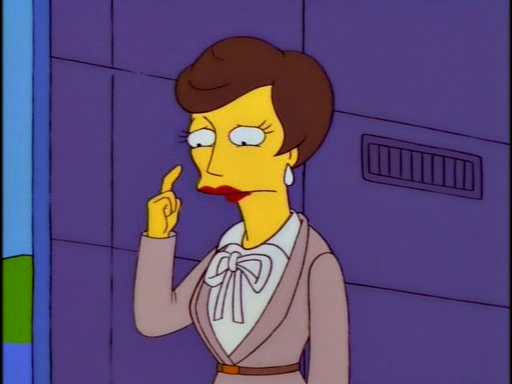 Patty: You know, Selma, James Bond has a license to kill. Homer (offscreen): Stop forcing banter! Selma: But a lot of people would kill for these licenses. Lisa: Ooh, here comes an audience member now. Homer: One guy in the In Memorium reel was alive when it started! Lisa: Don’t forget your giftbag! It goes on from there, but you get the idea. They know this show is bad. They don’t care. – After that, Homer drives for a long time so he can get some real fast food since Krusty Burger is now Japanese health food, or something. – Arriving at a hot dog place, we get this timely gem: “Chewy, we’re home. Chewy is what I call my mouth.” I love it when the jokes slip seamlessly into the dialogue. – Grampa just appeared in a scene for no reason. Can’t remember the last time an episode didn’t have someone materialize out of thin air. Marge: Patty & Selma lost their jobs at the DMV because they spent too much on the awards show. Selma: We went over the forty-three dollar budget. Patty: By a hundred thousand dollars. Marge: To save money, I said they could live here for a while. We don’t see Patty or Selma again after this scene. I’m so glad it was here. – Hey, the B-plot just showed up real briefly. Hi, B-plot! – We’re on like the fourth montage now after Homer fires himself so he can go back to the hot dog stand. – B-plot scene alert. Principal Skinner is there for no reason, he takes her hat, some kid runs in to say something, even by Zombie Simpsons standards this is shabby and strung together with chicken wire. Homer: Oh, no, the hot dog stand is closed. The place I forgot for thirty years is gone. – Then Homer wraps a chain around his neck and gets choked. – And now he’s driving off with the hot dog caboose in tow. Lisa: Chief Wiggum, maybe I can defuse the situation. Wiggum: De-fuse? Well, there’s a first time for everything. Lisa: Can you hand me your mic? Wiggum: Every police regulation says no, but you know what says yes? – Now a bunch of fat guys, who were happily eating the health food ten seconds ago, are dragging this caboose up a hill because, uh, reasons. It goes on for twenty seconds. – Old hot dog guy is back and now he remembers Homer for no reason. – Ralph, who shows up out of nowhere asks why the cartoonish moon (which is playing a saxophone) needs sunglasses. – And finally, we end on mascot cannibalism because, sure, why not? Anyway, the numbers are in and for once the Grammys are good for something. Last night’s screenwriting atrocity was witnesses by a mere 2.45 million viewers. I haven’t been keeping my ratings spreadsheet up to date because I’m lazy, so I don’t know where that ranks, but it’s really bad.